Illuminate My Way Back to Reading! 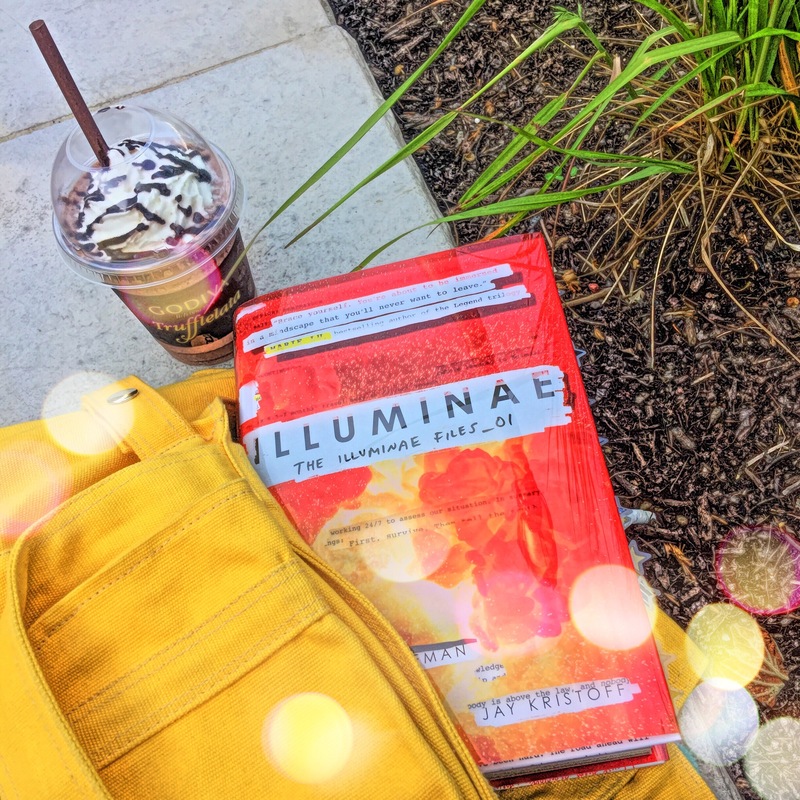 Even before I attended bookcon, I’d been seeing Illuminae in the bookstagram community with alarming frequency. The vibrancy of the cover just screamed “READ ME, I DARE YOU!! !” I wouldn’t lie but when I saw the title, the first thing that came to mind was Illuminati, haha! Thoughts of “was this going to be a mystery/thriller type?” or “maybe it’s a cracking down of the conspiracy theory behind the organization?” kept buzzing around in my head. If so, I was fast starting to lose interest, but I decided to read the synopsis first before making a decision- turned out I was totally wrong with my assumptions, and you know what they say when people assume, eh? Anyways, I would not bore you by copying and pasting a synopsis here, but my mind was totally blown to the next galaxy when I finished it. I was so relieved and ecstatic that I loved Illuminae because I got the chance to meet and greet Amie Kaufman and Jay Kristoff at bookcon. I bought the book at the convention, got ARCs of the sequel, Gemina, and had my books signed even before reading it- insane, right? I figured that if I ended up not liking it, I could just give it to fellow bookish friends who loved it. I was so happy that was not the case! This book was so special to me because it really got me back into reading again…it just revitalized and inspired my being into getting back into the thick of bookish things again. So, enough with the crazy talk and let’s move on to my thoughts on the book itself. 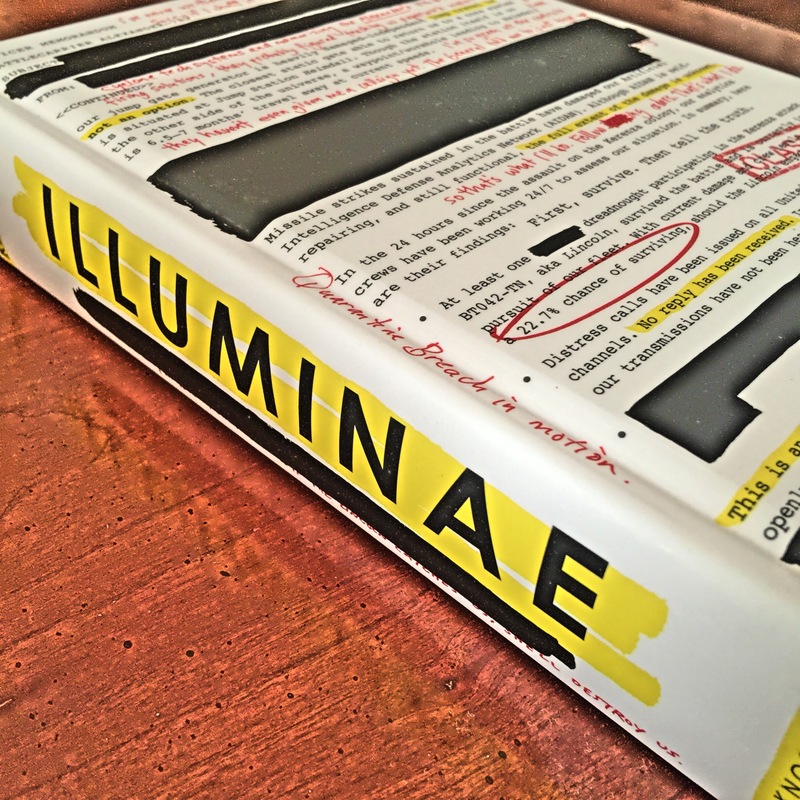 Illuminae had to be, if not, the most unique book I had ever read when it came to narration. First or third person, you say? Chuck those boring POVs because Illuminae was just too badass for that! This book was narrated via dossiers of files, reports, emails, schematics, hacked documents- you name it, it’s there! I’d like to try a review system that would be spoiler free while giving you a feel of whether you’d like to pick this book up or not via categories with a 1-5 rating (with 5 being the highest)! This whole book was one ginormous cliffhanger for me. It was not predictable at all. Even the beginning was already action packed because Kaufman and Kristoff immediately threw us into the conflict of things. Think Star Trek mashed with Resident Evil, and the Walking Dead- it was that insane! It’s a survival against an invading army, contagion, loved ones, and a well-meaning but too logical AI. There was also a dash of teen romance in this, but what I really appreciated was not the build up of the love but the continuation of it despite the circumstances. It’s not just a question of whether the protagonists would survive- their relationship was at stake too. Confused? Good! You have to read it for yourself! I very much enjoyed the main characters at the start but by the end, thoughts of “seriously?” “blerghhhh” “meh, too cliche” popped here and there because there were Mary Sue and Gary Stu elements that I did not appreciate. I had to remind myself that this was a YA fiction, so some deus ex machina should not have been surprising, so I let that pass. What really wowed me was not the protagonists but the antihero; antagonist was too strong a word for my favorite character. Just think Spock, who valued logic over emotions, and you would definitely sympathize with the character. Some of my friends absolutely hated him, but I’m a veritable villain sympathizer so I was all, haters gonna hate, haha! The supporting characters were very strong too! They were not the costumed building or tree extras you would find in a children’s play, you know, just there to make everything else prettier or so your kid would have a role to fill. They had substance and were definitely integral to the progression of the plot. I found that my feels were summoned from the ether mostly because of the secondary characters, and how novel was that? I should have already expected the unexpected when it came to this book! The best part was that the most profound character development occured on one of the secondary characters, so yay! I had so much fun reading this because as I mentioned before, you get the story through different medias and files. Some did not like this way of narration because it was confusing, too technical, or trying too hard. I didn’t see it like that at all but just like with everything, Illuminae could not be for everyone. The way things were conveyed was pretty straight forward- no purple prose here, no siree! While I did appreciate flowery and beautiful language from my Shakespeare and poems, I also liked it when writing could be short, concise, and cut to the heart of things. This no-nonsense method worked well for this story because Illuminae was action driven. The authors did not waste time with the inner most thoughts of the characters…you learned who they were through their decisions, actions, and reactions. The language did get crass and dirty on some parts because there were sexual elements, but they were not explicit. 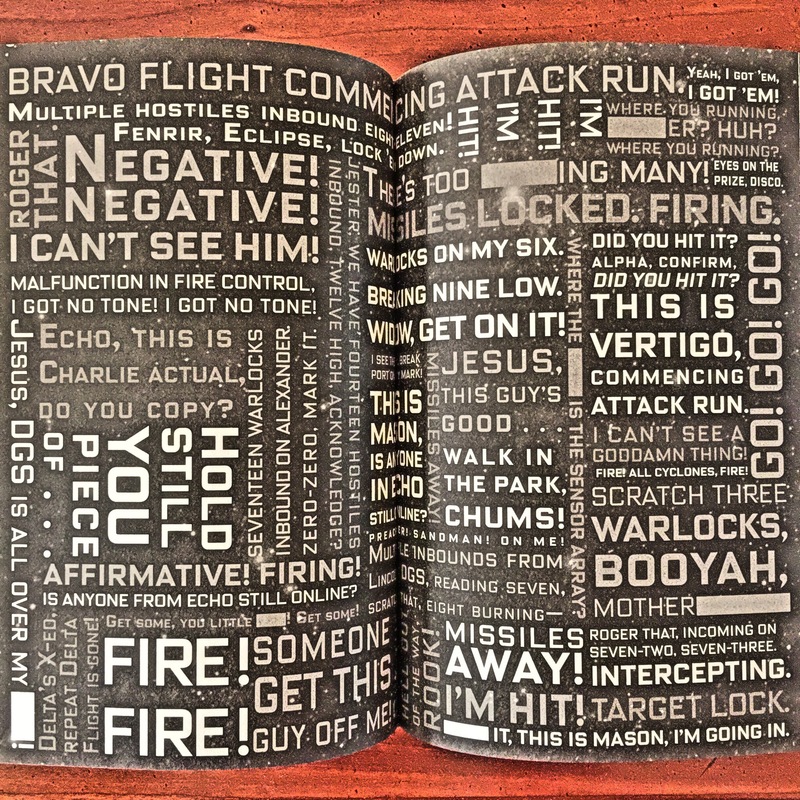 Moreover, I adored the usage of words to produce literal imagery on the pages. Things like these made the reading experience more interactive because you had to turn and spin the book in certain ways to read through the page. Others found that annoying, but I loved it because it wasn’t just the characters who were going through the action- we were there with them too! After surviving through this clusterfudge of epic proportions, I didn’t really think “what was the point of all this?” I don’t know how to say this without spoiling something but what I was left with after reading Illuminae was that adversity definitely shined a light on who was a survivor or a quitter. That when push came to shove, how far could we push through our limits? That despite all the ugliness and imperfection, we were worthy of salvation. That resilience was the name of the game. That even the smallest glimmer of light was enough. That the world was beautiful. All in all, this book gave back the passion I once had for the written words. It was a second chance for me, and I couldn’t be more grateful. 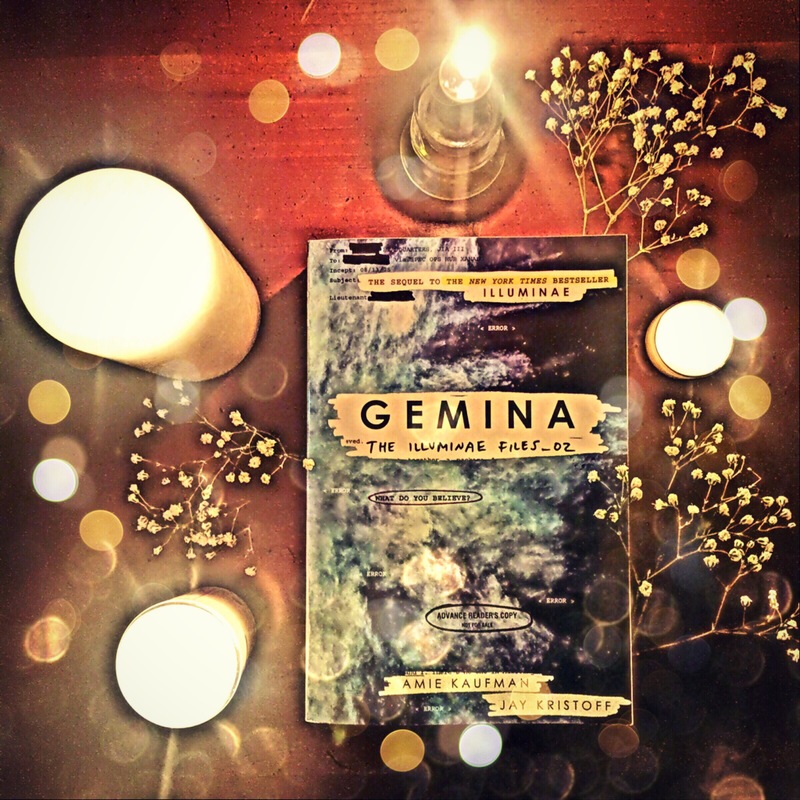 Currently, I’m reading the ARC of Gemina, the sequel, so I’ll definitely give a review for that as well. I’m so excited what the final copy will look like on October!